Born in Buenos Aires, Argentina, grown up in Brazil Torcuato Mariano started his music studies at early age of 14. In Brazil he toured as guitarist with Sergio Mendez, Ivan Lins. He also played and recorded with singers Djavan, Gal Costa and saxophonist Leo Gandelman. His debut album Paradise Station was released on Windham Hill in 1994. His further albums are Last Look (1995), Diary (2004) and Lift Me Up (2005). The hiatus is explained by the fact that he retreated behind the scenes as A&R director of EMI Brazil, where he stayed until 2002. His contemporary restart So Far From Home (2009) is launched on America’s hottest independent label NuGroove Music. Joined by top-notch musicians Vinnie Colaiuta (drums), Neil Stubenhaus (bass), Davi Feldman (piano) and many more this album is doomed to success. Torcuato composed all songs with the exception of Tell Me Your Dreams which he co-wrote with Andre Vasconcelos. Torcuato Mariano introduces into his album with the title song So Far from Home. His passionate style of acoustic guitar performance showcases his unique charisma and personality. Marquinhos "O Socio"'s shimmering vocals deliver flavors of Pat Metheny's music. The sweetness of New World is unsurpassable. Marcelo Martins' bird calling flute and David Feldman's piano poetry are a perfect addition to Torcuato's divine guitar play. On Back To The Road Torcuato's guitar is the absolute focal and acoustical point brilliantly counter parted by Marcelo Martin's tenor sax. British Time offers smoking acid jazz elements like a ducky bass, original Hammond B3 chords and Paulo Calansas' unique Fender Rhodes graced by Torcuato's guitar. Tell Me Your Dreams is featuring Torcuato's dynamic labelmate Michael Lington on sax. Lington was recently in our focus with his groundbreaking album Heat. With energetic guitar riffs enters Torcuato the terrain of contemporary jazz on DF following the path of Pat Metheny. The vocal lines are created by Marquinhos "O Socio"'. A great team. If you ever travel to Rio don't miss the beaches of Ipanema and Copacabana. Torcuato Mariano performs his impressions on Ipanema Sunset in the spirit of Carlos Jobim's Girls of Ipanema. On Midnight Words Torcuato celebrates his stellar acoustic guitar accompanied by his dream team. 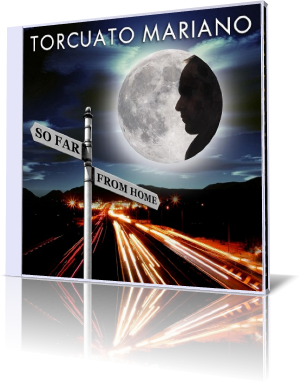 Torcuato is also a master of the blues as he showcases on the melodic Blues Days. Magic House is featuring Hamilton de Holanda on Bandolin and Alessandro BB on Accordion. Argentinean Tango meets Contemporary Jazz in a jamming mixture. Torcuato sets with his new album So Far From Home a standard of guitar innovation. His artistry is discreet but unwavering touchable. The connoisseur listens and enjoys.